Tow with Rope - Atlantic Braids Ltd. The mission of this page is to improve education on the proper use of these synthetic line products and to make these products readily available to a wider audience. Synthetic winch lines have been used for years in the off-roading and atv industries and they are now making their way into commercial towing applications albeit with some resistance. Without knowing the strength and performance capabilities of modern synthetic lines, the idea of swapping out steel cable for a “plastic rope” can be a tough concept for many to accept. If you find yourself doubting the strength and ease of use, then purchase one of our extensions as they offer an excellent opportunity to witness first-hand the strength of SupreemX-12 and to appreciate some of the advantages before making the big switch. It has been our observation that most operators prefer working with a synthetic line and after making the switch never go back to steel cable. Safety – Should your synthetic break, the energy released is much less then that of steel cable, as well the rope is lighter and softer reducing the chances of injury even further. Light weight – Weighs significantly less than steel making it much easier to use and handle, especially on long recoveries where extensions may be needed. Safer on hands – The rope is smooth with no burs reducing the chance of cuts and injuries during usage. No memory means no flat spots or kinks – Even if the rope winds back on itself in the winch, any visible flat spots are purely aesthetic and disappear once put under load. “Birds Nesting” no longer an issue – Again, the rope can wind back on itself and dig back into itself however it will cause no damage to the rope and is easier to pull out vs. steel cable. Floats on water – For those that do a lot of water recoveries, this property has a profound impact on safety and ease of use. Chemical resistance – SupreemX-12 has excellent resistance to acids and alkalis, lubricating oils (motor oil), hydraulic fluid, de-icing fluid (radiator fluid), jet fuel and cleaning fluids and solvents such as isopropyl alcohol. Sharp edges – The main danger in working with synthetics is sharp edges. SupreemX-12 is extremely abrasion resistant however if under tension against a sharp edge the risk of severing the fibres is high. This means extra caution must be taken when working with wreckages or other situations that put the rope against sharp edges. We recommend not hooking up directly but rather hook up to a chain or bridal..
High Heat* – SupreemX-12 is made with Dyneema® fibres which can be used from cryogenic conditions up to a working temperature of 70°C (158°F) and melts around 144°C – 152°C (291°F – 306°F). If your winch generates high levels of heat as with winches utilising internal braking systems, the first wrap around the drum can either be covered with a sleeve of Nylon Cordura or the section of line in contact with the drum can be made with Vectro-12™ and spliced (end-to-end) with your SupreemX-12 winch line. More pricey – Depending on the quality of steel cable you use, the synthetic winch lines can be up to roughly 2 times the price of steel cable and sometimes more. This isn’t a case of huge margins but more the differing price of the raw materials. Depending on how often you replace your cables due to flat spots or kinks, you can make back your extra cost rather quickly. Add to that the benefits you enjoy due to working with the synthetic rope, users usually don’t have any issue with the price discrepancy. *If high temperatures are a legitimate concern for your application or if your winch has a brake inside the drum producing high heat, an insulating jacket can be applied to the line at the drum. In extreme cases the use of a different synthetic material with high heat resistance may be advised, contact us. Atlantic Braids ltd. and B/A Products manufacture winch lines using genuine SupreemX-12™ made from Dyneema®. These lines have working load tags and they are colour coded based on their diameter for easy identification on the road. Contact us to find the SupreemX-12™ dealer nearest you! Frank Sanchez, Somerset Hills Towing; Bridgewater, N.J.
Our synthetic winch lines work in almost all applications including through sheaves and side pullers. Threre are some important points to make on this subject. Your line must be sitting clean in all the sheaves. Should your line be sitting on the edge and be under tension, the line could be severed. Also, be sure your line is sized properly for your sheaves. Synthetic lines flatten down under tension and if your line is too large for your sheave it could go over the edge of the pulley causing the fibres to be damaged or cut. Another point brought up by our friends at WreckMaster is sheave guides. The photo on the bottom left demonstrates a reality for many sheave guides, the entrance is a straight cut piece of square steel. The edges of this are extremely sharp and are a risk to the synthetic winch lines. To resolve this, the edges would need to be rounded to ensure a smooth entrance. As with steel cable, the lifespan of a synthetic winch line is extremly variable, depending on usage frequency, load applied and amount of wear and tear. If treated and used correctly, the synthetic lines should last every bit as long as steel and longer. 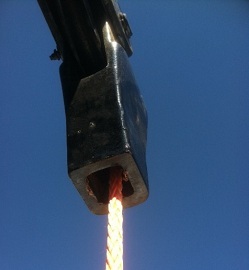 We guarantee the splices as well as the integrity of the rope under normal usage and within it’s rated working load. Any problem with a product can be addressed directly to us so that we can examine the problem further. All our batches of product are tested on our test bed and recorded with our software. If a batch does not meet it’s tensile rating we do not release it for use. We stand behind our products and ensure that quality is the number one objective. One element of synthetics that will take some getting used to is “What is normal wear and tear?” and “What does it look like?”. Where steel cable holds its look other than flat spots and dirt, synthetic fibre takes on a worn look as it is used. Many people ask us if this is normal and how do they know when the rope has been comprimised. The photo on the right shows a rope that has gone through sheaves multiple times. 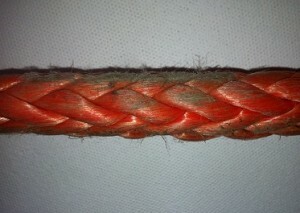 As the rope is used it is normal for the color to fade slightly as well for the rope to become a little “hairy”. This does not comprimise the strength of the rope. 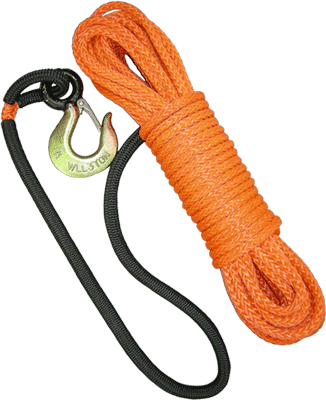 What needs to be visible are partly severed strands, completely severed strands or visible damage to the rope. 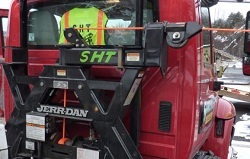 Many tow operator’s are working with synthetic tow lines for the first time are are not used to its properties, this is all part of the learning curve. As operators become more familiar with the rope they will be able to identify what is normal wear and what is a flaw in the line. For further details on when to retire synthetic lines you can refer to the Cordage Institutes PDF on “Fiber Rope Inspection and Retirement Criteria“.